With more than 1,000 passengers already stricken by a highly contagious gastrointestinal illness aboard cruise ships in recent weeks, a new outbreak was announced Wednesday by the Centers for Disease Control and Prevention. The latest outbreak, with symptoms consistent with the Norwalk-like virus which has plagued at least three other ships, sickened 117 people aboard P&O Cruises' Oceana, which was carrying 1,859 passengers on a 15-night Caribbean trip. The Oceana, operated by P&O Cruises of Great Britain, reported that 114 passengers and three crew members have been treated for some sort of virus, the Centers for Disease Control and Prevention said Wednesday. The ship is on only its third sailing; it made its inaugural voyage from Port Everglades on Nov. 1, officials said. 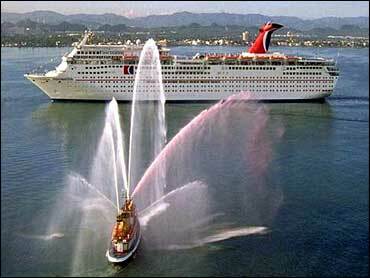 It is currently carrying 1,859 passengers on a 15-night Caribbean trip. Most of the sick passengers traveled to Fort Lauderdale on the same charter flight from Manchester, England, a CDC spokesman said. Federal health officials are expected to board the ship to open an investigation. The problems aboard the Oceana mimic recent troubles on Holland America's Amsterdam, Carnival Cruise Lines' Fascination and Disney Cruise Line's Magic. More than 1,000 passengers aboard those ships have become sick in recent weeks, despite heightened disinfection and cleaning efforts. The Amsterdam, which left Port Canaveral on Sunday with more than 1,200 passengers aboard, was held at Port Everglades in Fort Lauderdale for 10 days to be thoroughly decontaminated after about 500 people fell ill on its last four trips. CDC officials said Wednesday that three people had become sick on the Amsterdam's current voyage. The Norwalk virus causes severe diarrhea, stomach pain and vomiting for 24 to 48 hours, according to the CDC.